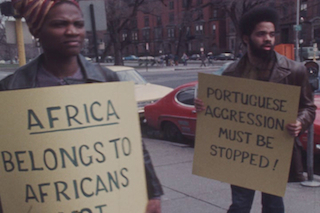 Raw footage related to the Pan-African liberation efforts recorded for Say Brother in 1972. Includes Boston African Liberation Day Committee press conference (1972); protestors outside the Portuguese consulate (1972); a clip from the Congressional Black Caucus National Priorities Forum press conference (April 1972); protesters in Harvard Yard seeking Harvard University divestment of Gulf Oil stocks, and US withdrawal from Southeast Asia (April 1972); press conference featuring Pan-African Liberation Committee and Harvard-Radcliffe Afro statement announcing occupation of the offices of Harvard University president Derek Bok, statements from Boston African Liberation Day Committee and others (April 19, 1972); and protestors in Harvard Yard (1972). Chicago: “Say Brother; Coverage of Pan-African liberation organizing efforts,” 1972, WGBH Media Library & Archives, accessed April 24, 2019, http://openvault.wgbh.org/catalog/V_ADE6DD8B0FB445E886D09C0AF1FEEDDE. MLA: “Say Brother; Coverage of Pan-African liberation organizing efforts.” 1972. WGBH Media Library & Archives. Web. April 24, 2019. <http://openvault.wgbh.org/catalog/V_ADE6DD8B0FB445E886D09C0AF1FEEDDE>.